CSA 8, 2¢ brown red tied RICHMOND / VA // JAN / 28 cds on homemade cover to "Floyd L. Whitehead, Assessor CS Tax, Roseland, Nelson Co., Va"'; Nelson County is in central Virginia bordered on the east by the James River and on the west by the Blue Ridge Mountains; scarce CIRCULAR RATE, SCV $1,500. CSA 8a, 2¢ pale red tied by CHARLESTON / S.C. // DEC / 21 cds on locally used cover to the State Bank. $900. CSA 8, 2¢ brown red, vertical strip of four and a single, tied by three strikes MACON / GA./ / OCT 1 cds on cover to “Hon W.E. Smith, Albany, Ga.; strip with margins nearly all around and nick at top left, single margins irregularly torn and into design, Very Fine and rare use, 2010 SCV $4,500 as strip of 5. $3,500. 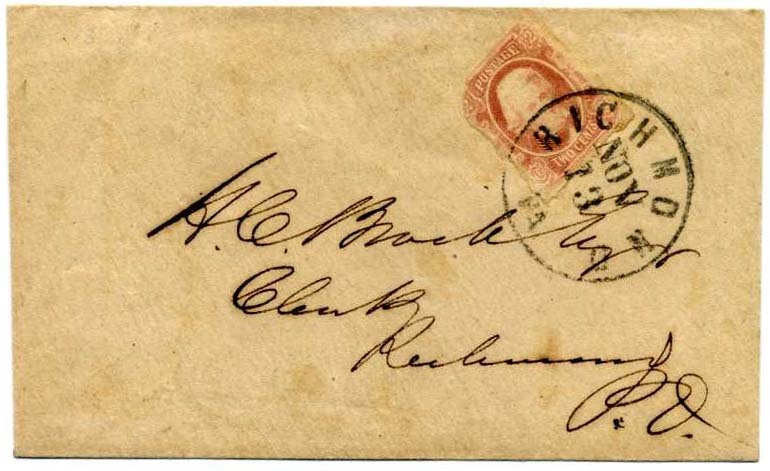 CSA 8a, 2¢ pale red (small faults) tied RICHMOND / VA // NOV / 18 cds on cover to A. C. Brock, Esq., Clerk, Richmond, nice drop use, slightly reduced at right, ex Malpass, 2010 SCV $1,500. $900. 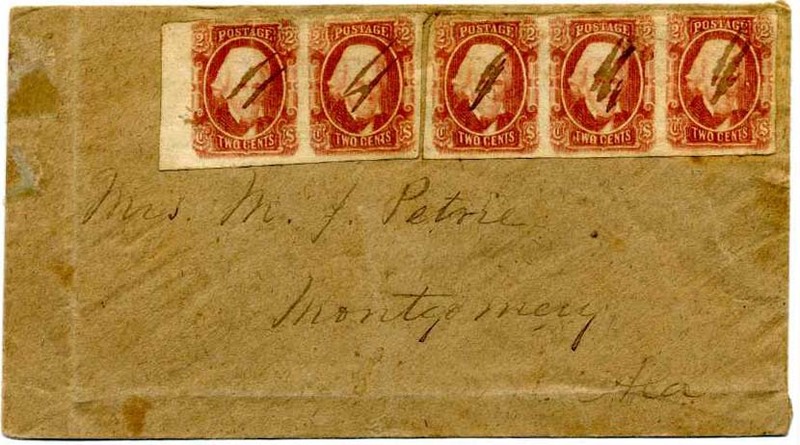 CSA 8, 2¢ brown red pair and strip of 3 (probably from the same strip as the separation appears to fit) with manuscript cancel used on homemade cover to Mrs. M. J. Petrie, Montgomery, Ala; cover crease at left and vertical crease in left stamp. $900. 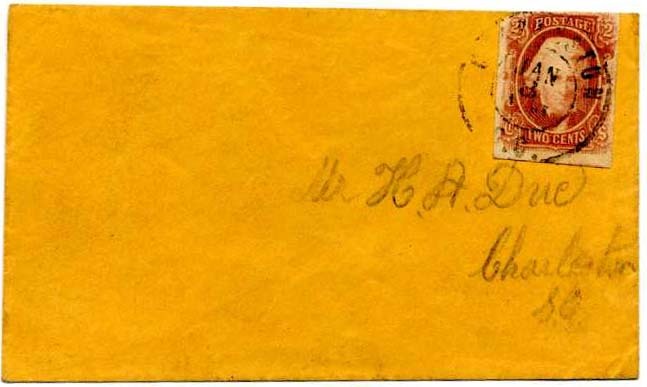 CSA 8, 2¢ brown red tied CHARLESTON / S.C. // JAN / 8 / 1864 on small darling local drop cover to Mr. H. A. Duc; signed Dietz and MacBride, Ex Babb, Bogg and Wm. A. Fox. 1981 PF Certificate #100 440. 2012 SCV $1,500. $1,500. 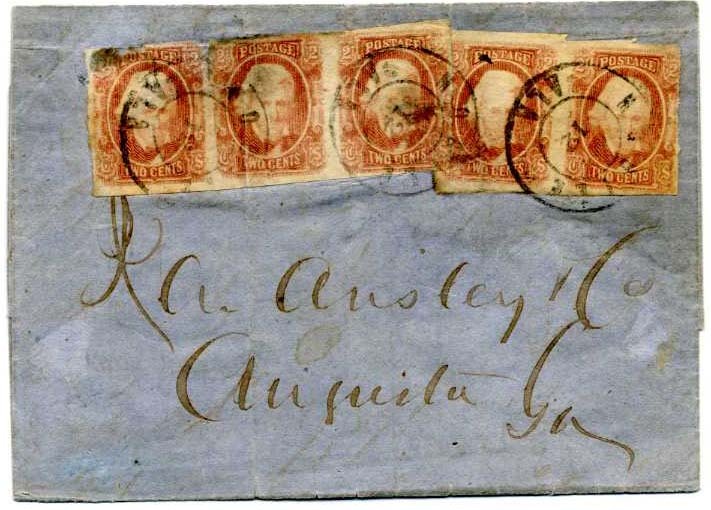 CSA 8, 2¢ red brown strip of 3 and pair tied by triple strike of MOBILE / ALA // OCT / 12  double circle on folded business letter to R. A. Ansley & Co., Augusta, Ga.; file folds and splits and stamps with “some defects” as noted on 1976 PF Certificate 57 594. A strip of 5 on cover catalogs $4,500. $950. 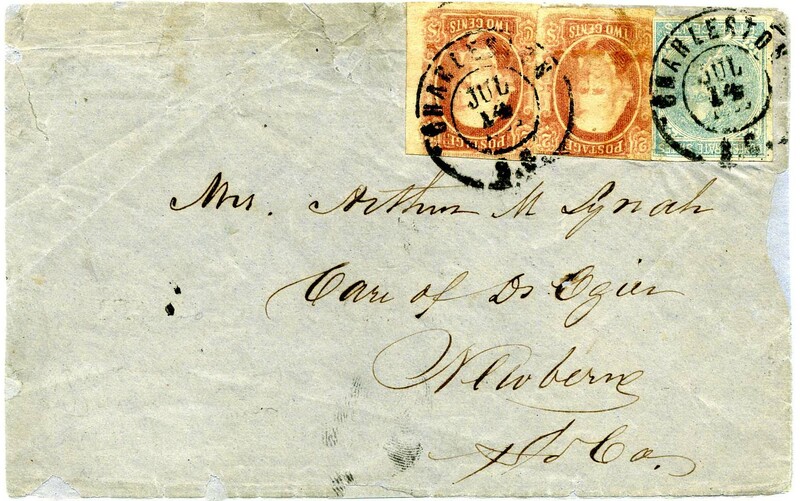 CSA 8, 2¢ brown red with minor double transfers in both TWO CENTS and POSTAGE, tied by neat CHARLESTON / S.C. // FEB / 9 / 186_ cds on local drop cover addressed to Assistant Surgeon G. W. Garmany, 1st S.C. Artillery, Half Moon Battery, Charleston, S.C. with manuscript "O.B." (Official Business) and “The P.O. Charleston SC” at top, [SC] Wonderful medical local drop use which comes with unpublished and very detailed bio courtesy of the F. T. Hambrecht & J. L. Koste biographical register of physicians who served the Confederacy in a medical capacity. SCV $1,500. $1,300. 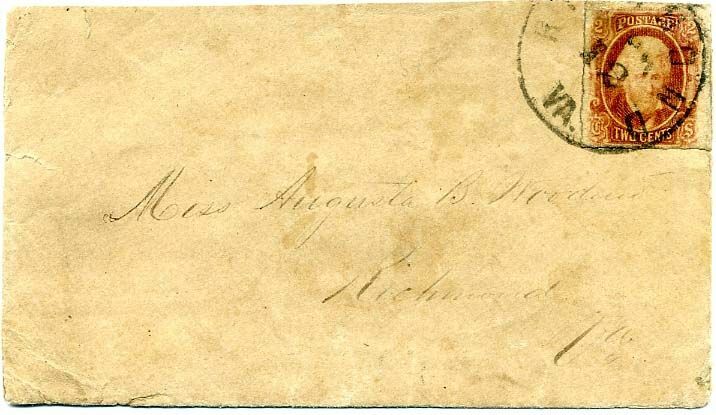 CSA 8, 2¢ brown red tied by RICHMOND / VA. cds on locally addressed drop letter to Miss Augusta Woodward; cover and stamp faults, no flap, Scarce SCV $1,500. $700. 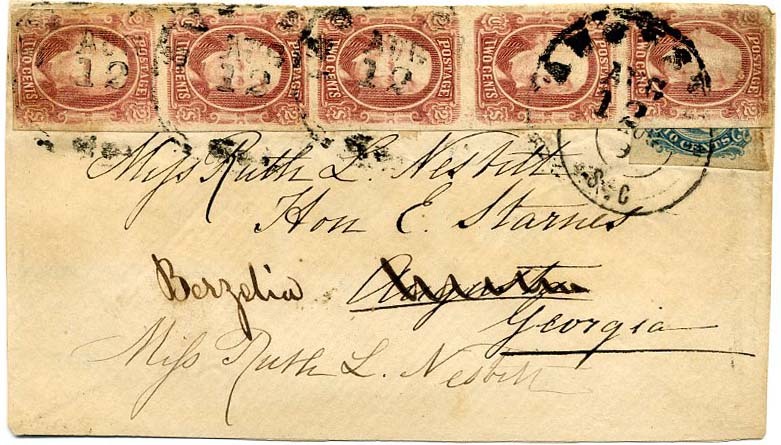 CSA 8, 2 ¢ brown red (3 singles) and CSA 7, 5¢ blue single tied together on back flaps of cover which overpaid the 10¢ rate, addressed to William Crawford Esq., Mount Sidney, Augusta, Ga. This appears to be contemporaneously misaddressed to Georgia, as the only Mount Sidney was in Augusta County, Virginia. The 5¢ blue was damaged prior to use, two of the 2¢ stamps torn upon opening; open on 3 sides and slightly reduced with light vertical creases. 2001 CSA Certificate #04005. Very unusual and scarce use. Very unusual combination franking. $950. 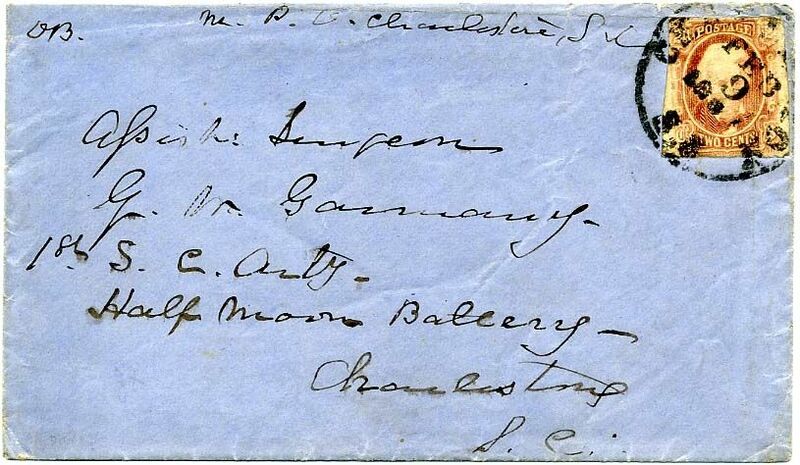 CSA 8, 2¢ brown strip of four tied by CHARLESTON / S.C. // NOV / 10 / 186- cds on legal-size cover to local address and FORWARDED to Camden S.C., forwarding postage partly paid by CSA 12, 10¢ blue tied by CHARLESTON / S.C. // NOV / 13 dcds with pencil "Due 30" uprated to "32" in pen, expertly repaired including top flap added. 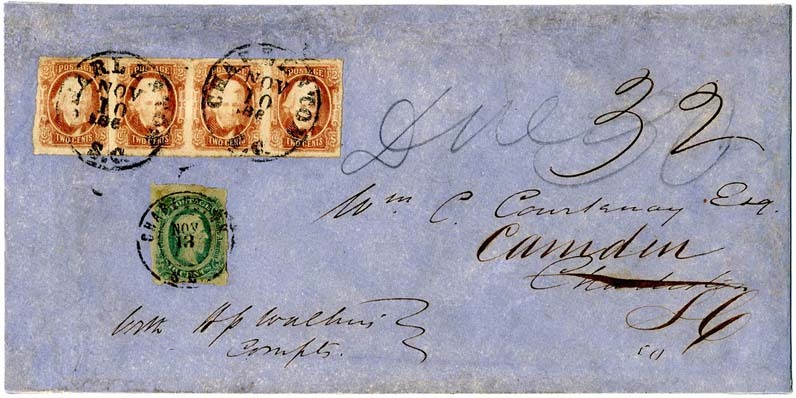 Scarce quadruple-rate cover, when forwarded it was no longer eligible for drop rate and so underpaid, the additional 2¢ may be for advertising, ex Sam Zimmerman who specialized in 2¢ rate covers. A real showpiece. $3,000. 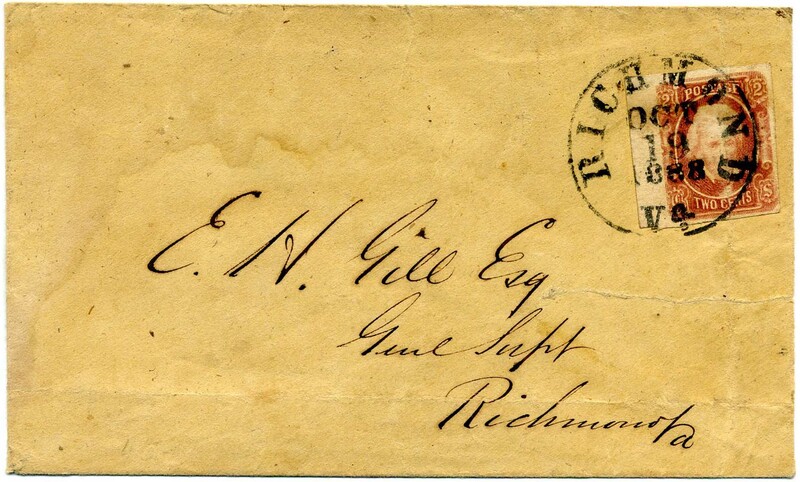 CSA 8, 2¢ brown red left sheet margin single tied on drop letter by RICHMOND / Va. // OCT / 19 / 1863 cds to E. H. Gill Esq, Genl. Supt., Richmond, Va. Slightly blurry cds, pressed vertical file fold at right through stamp and cover as well as file fold at bottom and sealed tear at right edge, none of which are mentioned on 1960 PF Certificate. Plantation Collection. SCV $1,500. $700. Edward H. Gill, was Superintendent of the Richmond and Petersburg Railroad. More information on the linked page. CSA 8, 2¢ brown red strip of 5 with right sheet margin at right used to sealed back flaps of cover tied with three strikes of SCOTTSVILLE / VA. // SEPT 1864 cds. 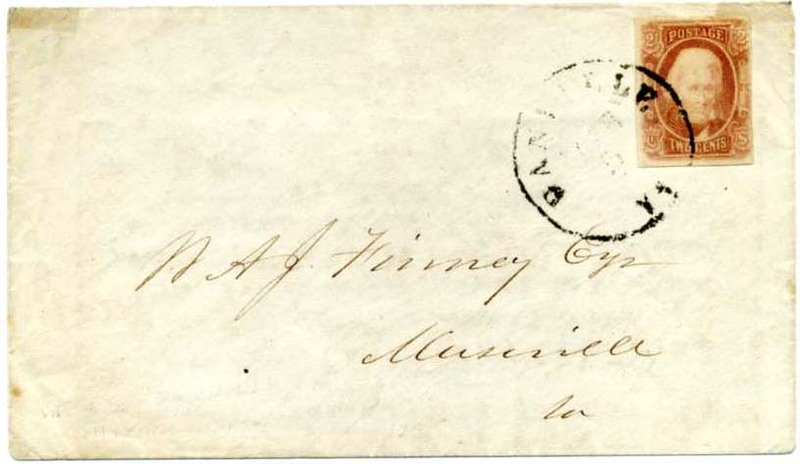 Per the 1976 PF Certificate, “the third and fourth stamps are damaged by opening and are now mended and are genuinely used on cover.” A fourth strike of the postmark, dated Sept, is used on the obverse and is addressed to well-known nurseryman Franklin Davis, Staunton, Va. with content docketing indicating correspondent was Jno. O. Lewis. SCV $4,500. $3,000. Mrs. Jno. O Lewis buried jewelry near their chicken house which went undiscovered while the Yankees stuffed hams in their knapsacks and strapped dead chickens to their saddles. More information on the linked page. CSA 8, 2¢ brown red tied RICHMOND / VA. / Nov / 4 (1864) to Leatherwood, Virginia; part of homemade wrapper (most of back missing) made from a letter with significant historical content regarding the governor of Georgia. Rare adversity use to create a newspaper wrapper made from a portion of a handwritten letter that reads in part, "[we learned] this morning that Governor Brown has deserted the Confederate cause and gone with the Federals calling upon all Georgia Soldiers to throw down their arms and follow him. Of course I do not credit this in the least; but just mention it for the purpose of illustrating the great demoralization which has so recently & so unnecessarily seized the people ..." Great historical content, piece of lower left corner restored. Ex Cipolla. $1,000. 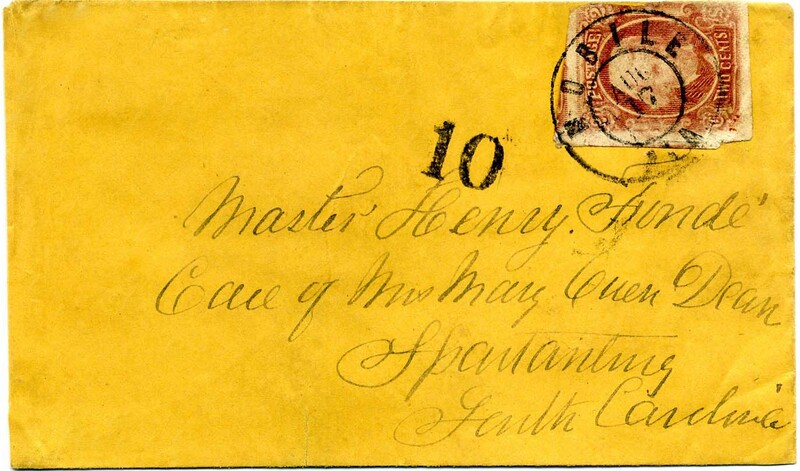 CSA 8, 2¢ brown red (small defects) tied MOBILE / ALA // AUG / 17 double circle datestamp on small cover to Master Henry Fonde (son of Charles Henry Fonde of Mobile), Care of Mrs. Mary Owen Dean, Spartanburg, South Carolina. Used with Mobile [DUE] 10 handstamp showing woeful UNDERPAYMENT OF POSTAGE Interesting use. $850. 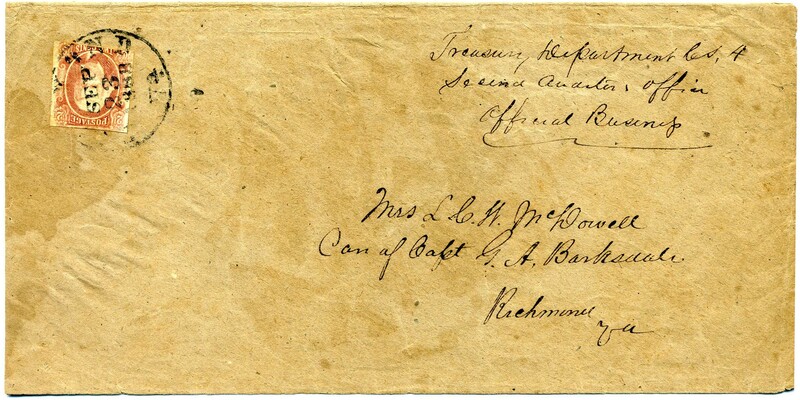 CSA 8, 2¢ brown red tied by RICHMOND / Va. // SEP / 23 / 1863 cds on legal size semi-official cover with manuscript “Treasury Department C.S.A., Second Auditor’s Office, Official Business,” to Mrs. L. C. W. McDowell, Care of Capt. 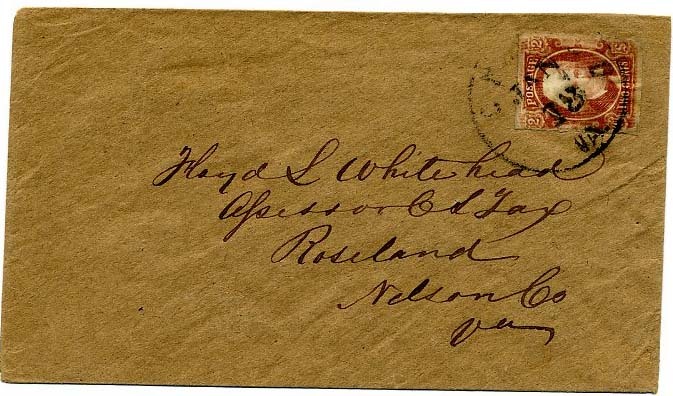 G. A. Barksdale, Richmond, Va., light water stain at left cover edge and slightly reduction. $1,400. George A. Barksdale served as Quartermaster in Field & Staff of the 16th Virginia Infantry. 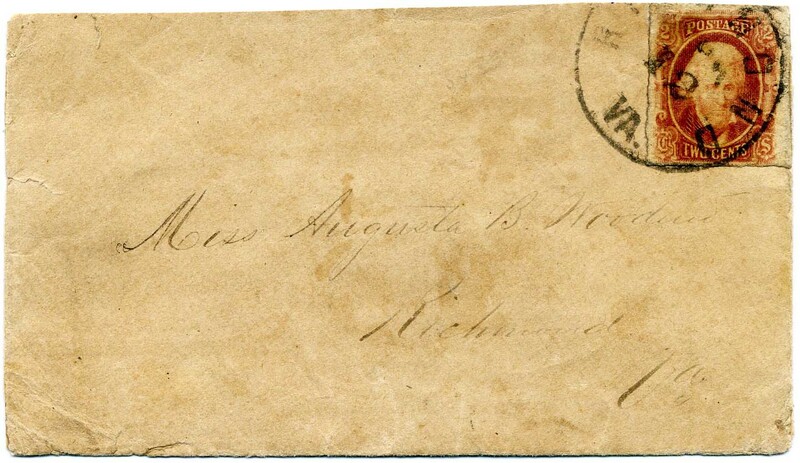 CSA 8, 2¢ brown red tied by RICHMOND / VA. cds on locally addressed drop letter to Miss Augusta Woodward; cover and stamp faults, no flap, SCV $1,500. $500. 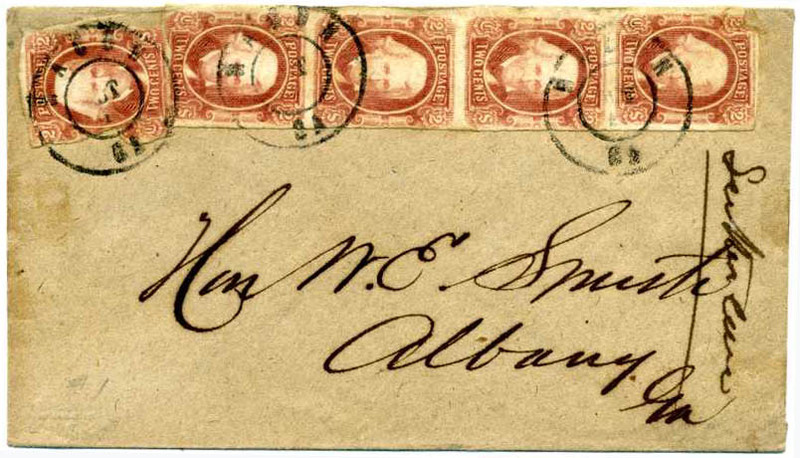 CSA 8, 2¢ brown red tied by DANVILLE / VA. cds on unsealed envelope to “W(illiam). 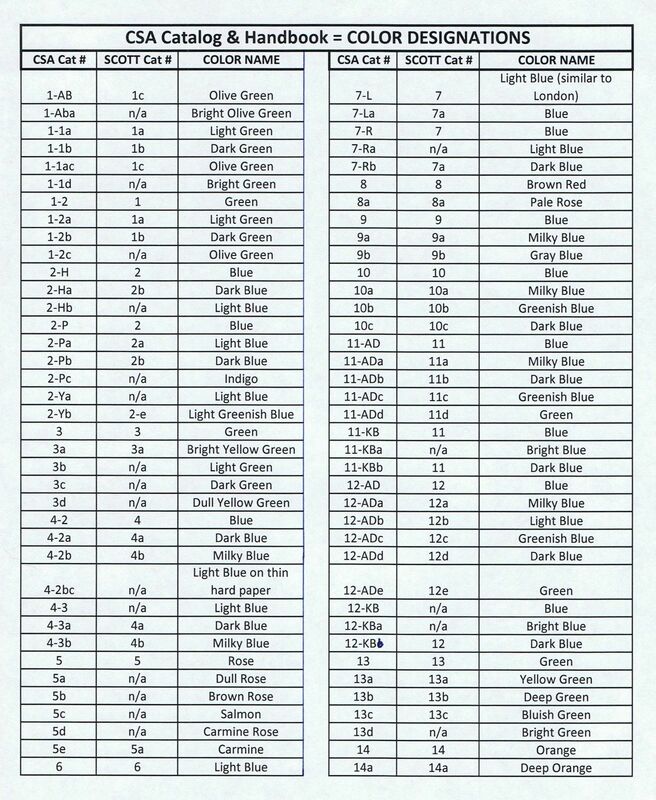 A. J. Finney, Esq., (Pittsylvania County) Museville, Va.” thus confirming that this is the SCARCE CIRCULAR RATE as opposed to local drop use. Few trivial edge faults. Ex Littlejohn and Cipolla. Civil War era Finney correspondence is in Duke University Library with many references to the slave trade. $950. CSA 8, 2¢ brown red horizontal strip of five, large margins to barely in, tied RICHMOND / VA. // SEP / 20 triple strike cds and manuscript on blue legal-size cover to S. G. Hensley, Wytheville, Va. with Confederate States of America, War Department, Nitre and Mining Bureau. Official Business. imprint (WD-NM-05, CV $500), with two matching enclosures which are dated Sep. 3 and Sep. 21 to Jno. W. Greene & Co., but is definitely the same hand. Docketing at left “James Boulden of Wythe County Virginian, Wytheville.” But letters are from Lt. Col. Richard Morton with one referencing the other and logically sent by Morton. Slightly reduced at left and some wear including edge and back flap tears, tiniest stamp faults of little to no consequence. 2005 PF certificate. SCV of strip on cover $4,500 with no regard to scarce imprint. RARE and showy USE. $2,000. Major Jonathan W. Green owned and operated furnaces at Mount Hope from 1861 or 1862 which provided pig iron to the Confederacy. Lt. Col. Richard C. Morton, stationed in Richmond, oversaw Nitre and Mining Service of Virginia, North Carolina and Tennessee. CSA 8, 2¢ brown red—two copies—used with single CSA 7 tied by two strikes of CHARLESTON / S.C. // JUL / 14 double-circle datestamp on cover to Mrs. Arthur M. Lynch Care of Dr. Ogin, Newberne, No Ca, with no indication of postage due, small edge faults and repairs not mentioned on 1987 CSA certificate. RARE UNDERPAID USE AND MIXED FRANKING OF TYPOGRAPHED AND ENGRAVED ISSUES. Ex Brandon and Kilbourne. $1,900. 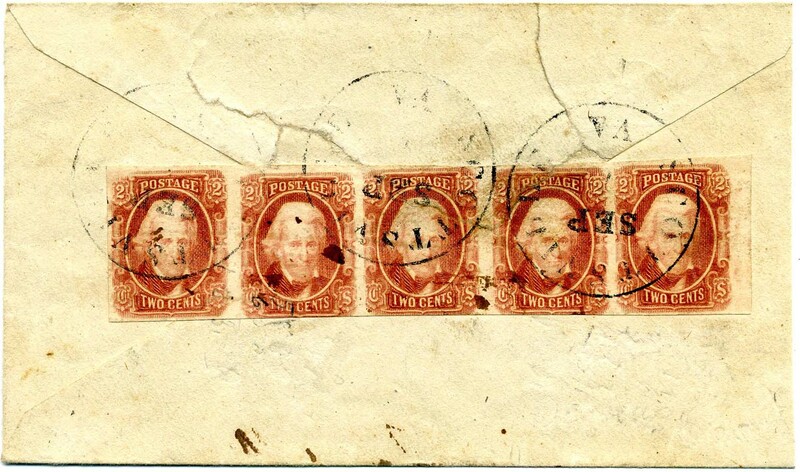 CSA 8, 2¢ brown red vertical strip of 5, large to clear margins, tied by four strikes of AUGUSTA / GA // AUG / 12 cds and USED AS FORWARDING POSTAGE on rebacked cover front to Miss Ruth L. Nesbitt, Hon. E[benezer] Starnes, Augusta, Ga., then redirected to Berzelia. Ga. 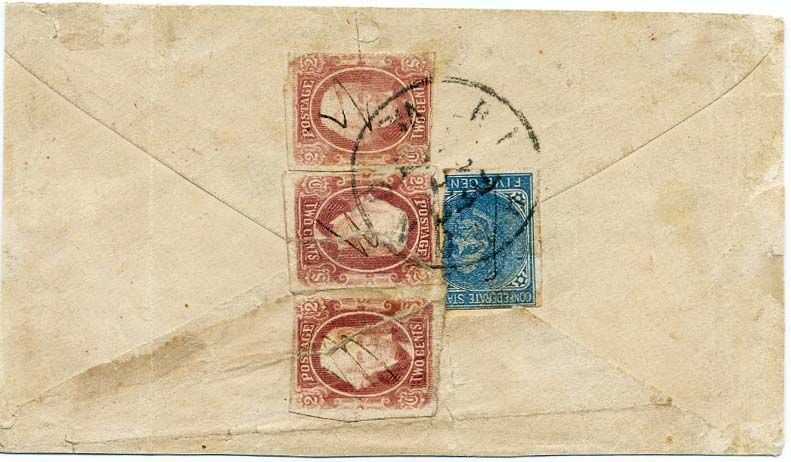 The cover originated in Cheraw, S.C., with CSA 11, 10¢ blue tied by August 9 Cheraw dcds, some slight toning and edge wear affects stamps, Very Fine appearance. According to a signed note by Peter Powell on the accompanying 1980 PF certificate, this is the ONLY RECORDED EXAMPLE OF A CSA 8 STRIP USED TO PAY FORWARDING POSTAGE. This sold for $6,037 in the Powell collection of Forwarded, Missent and Advertised Mail in 2006 (Siegel). 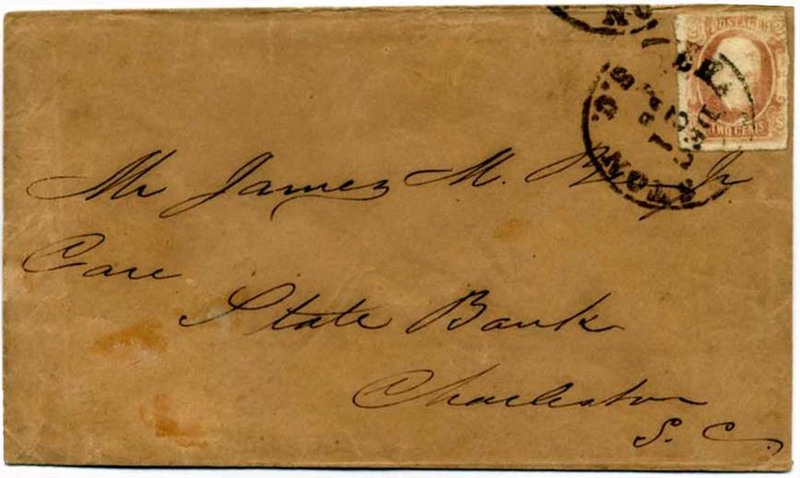 This MIXED FRANKING was written up in the Confederate Philatelist in 1988 and likely belonged to him as well. Extremely showy with great provenance. $5,500.